Where members of the clan Bryce are welcome! Twister: the Case of the Crooked Steamer! Note, this article was first published on www.bc4x4.com, which was owned and managed by some good friends, around 1999. After about 10 years, the article is now a bit out of date and was taken down. But I’ve put it here for posterity, since I’m still proud of this project. The Jeep 4.0L I-6, introduced in 1987, has received many praises over the years. And virtually every Jeep owner will surely agree with them. It produces very good torque, power, and throttle response from idle right to the red-line. However, this doesn’t mean that some Jeep owners still feel that there is something, well, lacking, especially if the engine is getting a little long in the tooth. There are a few options for late-model Jeep owners; these tend to follow the old adage that “there is no substitute for cubes”. One option is to swap in an entirely different engine. There are kits available to swap in most all of the popular V-8’s. However, this is not a viable option for many people since many unexpected gremlins often rear their ugly heads during these swaps. These can range from cooling, to electronics, to exhaust routing, to even oil-pan clearance. Locating the appropriate adapter to mate the engine to the transmission is usually the easy part! A second option is to build the 4.0L to produce more power. There are many options (even superchargers and turbochargers) available for this motor, and at least two companies sell stroker kits. Stroking is appealing since the power band can remain relatively low while increasing overall torque, especially if a rebuild is in order anyway. However, the price tags on these kits will make all but a very few bank accounts whimper! The following article overviews a project to build a stroker engine out of the Jeep 4.0L, but without going hungry for a few months. The 4.0L comes in 3 different flavors, the early (pre ’91) era 4.0L, the 4.0L HO version, and the current version found in the TJ. For the HO version, the factory updated the design of the intake, cylinder head, camshaft, exhaust, and EFI. The release of the TJ saw more improvements to the 4.0L, but these engines are still relatively scarce and expensive in wreckers. A great deal was found on a very fresh ’93 4.0L, which was used for the core of this project. Any 4.0L block would work, though. Before we dive into the project, I should state my goals. We are not going to try to build a high-horsepower engine. What we are looking for is a good, reliable stock replacement motor that has more low-end torque, and is equally ideal for the trail, the street, and cruising on the highway. The more low-end grunt the better. It will replace a 4.0L in an ’89 Jeep Comanche which has 280,000km on the odometer. Rick and Alan verifying correct crankshaft end-play. Yeah, right. The first step in any project such as this must be research. Some phone calls to companies producing stroker kits indicated that 4.2L (258ci) crankshafts can be and in fact are used. However, beyond this, information became difficult to obtain and was often contradictory. One source stated that custom rods and pistons must be used with the 258 crankshaft but refused to say why. In fact, I was told I could quote them on this! But finally after many phone calls, and faced with the research outlined below, they admitted it was possible to build a stroker using the right combination of factory parts. However, that was qualified with the statement that by using factory parts, the resulting engine would be a revver, not a torquer. This company will not be named nor mentioned in this article. Other sources suggested that the right combination of factory components should work but couldn’t produce details, or say for sure whether it was possible. So this project began by determining what combination of factory, and possibly custom parts, could be used – in theory. I state “in theory” because the actual assembly of components is needed to finally determine whether a combination of parts found on paper will actually work. Using information gleaned from the “Mopar Jeep Engines Speed Secrets & Racing Modifications” book, many similarities between the 4.0L and 4.2L were determined. The 4.2L crankshaft should fit the 4.0L block (at least in terms of journal sizes and clearances). Either connecting rod can be mated to either crankshaft and piston (but not necessarily work due to piston heights and compression ratios). By using the 4.2L crankshaft, the stroke would change from 87.4mm to 98.93mm, almost a half-inch increase! With the stock 4.0L bore (98.4mm), the resulting engine displacement becomes 4.51L, or 275ci! 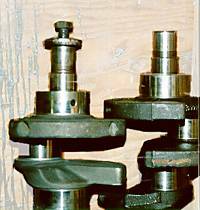 It doesn’t matter if the crankshaft will physically fit if the rest of the components won’t. For example, care must be made to ensure that the pistons do not contact the valves or the combustion chamber. (The Mopar Performance book recommends a minimum of 2.5mm between the valve and the piston at any time.) To keep costs down, I wanted to avoid using custom pistons if at all possible. This meant that the rod length must be changed relative to the change in the stroke. A possible candidate is the 4.2L rod. The first value can be verified against the block’s specified deck height and clearance of pistons below the block deck; it checked out. The second value shows us that there is not a clearance problem when using the 4.2L crank and rods with the 4.0L pistons. However, use of the longer 4.0L rod would require a custom piston. Note that it does not tell us whether the piston will go too low in the cylinder, or if the piston will clear the crankshaft counterweights throughout the stroke. This must wait until actual trial assembly. 4.0L piston/4.2L rod at top dead center. The 4.0L rod is longer (but lighter) than the 4.2L rod. Ideally, a longer rod should be used. The rod length affects the piston acceleration and deceleration and thrust angles during the stroke, which does affect power. Generally, a longer rod does produce more power, and according to the Mopar Performance book, the 4.0L stroke/rod length ratio is ideal. However, tests on Chevy V-8’s show that the power gains are not huge and for this application any increase in power should be negligible. The change in final piston height (from above) changes the total combustion chamber volume, so that has to be accounted for during these calculations. Starting from a stock 4.0L compression ratio of 8.8:1, the new compression ratio will become approximately 9.4:1 before any resurfacing to either the block or the cylinder head. 9.4:1 is starting to get a little high, but is still within the “acceptable” range for pump gas. Various other articles, both from offroad and from street car magazines, tend to draw the line at 9.5:1. Bolt pattern of flywheel flange on the crankshaft, so that we can use a late-model flywheel with the required fuel injection timing/trigger notches. The flywheel flange protrusion from the back of the block, to ensure a.) clearance between the flywheel and the block and b.) correct engagement by the starter. The diameter and depth of the pilot bearing hole in the crankshaft, to determine that a compatible pilot bearing (for the transmission input shaft) exists. 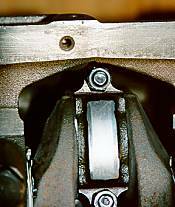 The “snout” of the crankshafts must be the same, so that no problems with regards to the timing chain or harmonic balancer or serpentine belt will appear. Clearance between the counterweights (and rods) and the inside of the block. Clearance between the 4.2L crankshaft counterweights and the 4.0L pistons, when attached to the 4.2L rods. Also needed is a suitable camshaft to handle the increase in displacement. Likewise, the stock fuel injection was designed to handle an engine displacement of 4.0L. Mopar Performance offers a kit to install the fuel injection onto older 4.2L’s, but a 4.5L displacement may be beyond the capacity of the injectors and the throttle body. Specifications on the injectors are difficult to find. Building a stroker engine certainly isn’t trivial! And at this point we haven’t even disassembled our 4.0L core! Now that we’ve done the research, it’s time to start playing with the actual engine components. An effort was made to use the best combination of high-quality name-brand components that were priced suitably. In other words, I did my best to “spend thrifty” without compromising the longevity of the motor. Block 1993 H.O. No overbore required, cylinders re-honed. Cylinder Head 1993 H.O. Valves lapped, head already port-matched from factory. Pushrods, Rockers, Valves 1993 H.O. Stock, re-used. Intake Manifold 1993 H.O. Port-matched. Pistons, Wrist-pins 1993 H.O. Stock, re-used. Rings Sealed Power P/N #E234X Cast, stock replacement rings. Camshaft Crane P/N #953901 Advertised to build power in the 1500-4500 rpm range. Camshaft Chain & Gears 1993 H.O. Stock, re-used. Crankshaft 1976 Magnafluxed, ground, polished (20-under rods, 10-under mains), rotating assembly balanced. Rods 1976 Bearing ends resized, rod bolts replaced. Mains Bearings Sealed Power P/N 7211M 4.0L bearings. Oil Pump 1993 H.O. Stock, re-used. Harmonic Damper 1993 H.O. Stock, re-used. Flywheel 1989 Stock, re-used but balanced, matches EFI. Exhaust Stock Grand Cherokee H.O. Factory 2.5″ exhaust. The core 4.2L crankshaft came from a mid-70’s AMC car, so is the heavier style. The crankshaft did need ground, but I did not have the rod journals “offset ground” to change the stroke. A slight grind offset to decrease the stroke would have dropped the compression a bit. As you can see, the 4.2L has already been shortened in this picture to fit the serpentine balancer/pulley. With the stroker crank, there was just enough clearance between the rotating assembly and the inside of the block. This crankshaft had a longer “snout” where the harmonic damper bolts on. The machinist trimmed the end of the crankshaft to match the 4.0L crankshaft when it was being ground and polished. The flywheel flange matched the 4.0L crankshaft. The earlier concerns about clearances turned out to be non-issues! The pistons cleared the crankshaft counterweights. There were also no clearance problems between the camshaft and the crankshaft or connecting rods. 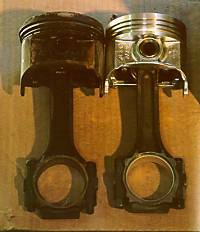 The piston did not “fall” too low in the cylinder at the bottom of its stroke. And the counterweights and rods cleared the inside of the block. The history of the 4.2L rods was unknown, so the rod bolts were replaced with factory Mopar replacements. No other company could guarantee delivery time, or sometimes even delivery. The Mopar Performance book explains that the pistons can be reversed (they are stamped for which way is forward) to increase torque, but at the expense of piston noise. I chose to stay with the stock configuration to avoid a potential pitfall which may mean misdiagnosis, and which would be difficult to cure. The computer has a knock sensor and extra piston noise may be confused with knock, resulting in the timing being retarded, thus defeating the efforts of achieving a bit more power. Notice that the 4.2L rod is shorter than the 4.0L. The Jeep I-6 block dates back to the ’60’s so it is no surprise that there are many camshafts available. Mopar Performance makes 5 specifically for the 4.0L. Isky, Schneider, Clifford, and Crane also offer a selection of camshafts. I could have also re-used the stock HO cam that came in our block. But, after many phone calls, and emails, I followed a recommendation and chose the Crane #753901 cam. This cam is advertised to produce power between 1500 and 4500RPM, right where we want it. 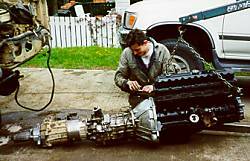 The camshaft was not “degreed,” as is recommended by many performance articles. The purpose of this is to absolutely maximize the potential output of the engine. Since we are not looking for every last horsepower, we decided against this extra expense. The 4.0L and 4.2L engines share the same main bearing dimensions and clearances. However, the main bearings list as different numbers. Should the 4.2L bearings that match the crankshaft be used, or should the newer 4.0L bearings be used? The tech guys from both Federal Mogul and Mopar Performance couldn’t help us here. So our machinist looked up in his bearing book, and the only difference is in one alloy. The alloy used in the newer 4.0L bearings was recommended for off-road use, so the decision was easy. I had to decide whether to use the stock 4.0L harmonic damper, or to source a 4.2L serpentine belt damper. I relied on one of the companies that builds the stroker kits here. The stock 4.0L damper can be used with their kit, so we used it in this engine. The entire rotating assembly was balanced since we were using parts from different engines. The cylinder head did not receive any more work other than a simple valve lap. No expensive combustion chamber work was performed. The Mopar Performance book verified recommendations by friends that this isn’t necessary for a daily driver. In fact, performance gains on the I-6 are reportedly insufficient to warrant such an expense for even most racers. The actual block assembly was not unusual from assembling any stock engine! All tolerances were verified with plastigage. We’ve now got a complete engine ready to install and test! We still have to deal with fuel injection issues such as injector size and the fuel pressure regulator. Installation, testing and debugging, and empirical results are covered in the final section. Freshened 4.0L head, 4.0L block machined, cleaned and ready for assembly. 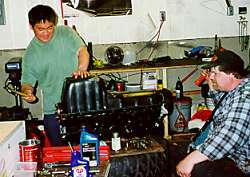 The installation of the long block itself was not unusual from any other engine swap. Since the block was the same, everything lined up as expected. One problem did arise, though. This engine is mated to a manual transmission, so a pilot bearing is needed. Sometime between 1976 and 1989, the end of the crankshaft to fit the pilot bearing was changed. This was one “gotcha” that I didn’t account for that cropped up during engine assembly. Plan for this before hand! We couldn’t source the right parts, and in the end we had to have the stock pilot bearing retainer machined to fit the appropriate pilot bearing. Luckily, the crankshaft didn’t require any modifications. Note that this problem can also occur if you are just swapping 4.0L engines from different eras. The complete assembly: 4.5L motor, AX-15 transmission, custom NP231 crawler box, NP231 transfer case. Fit the older TPS onto the newer throttle body: the new TPS is not at all compatible with the older EFI. Re-wire the temperature sensor: on the non-HO block, this sensor is located on the driver’s side of the block; the HO block locates this near the thermostat, which will produce a more accurate reading. Mate the non-HO fuel lines to the HO intake: the HO intake has both the fuel feed and return lines at the front of the fuel rail; the non-HO intake places the fuel feed at the back of the fuel rail, and the return line at the front. We used all of the older engine brackets to hold the air conditioning compressor, alternator, etc. We also used the non-HO distributor and flywheel to use the non-HO sensors. This is absolutely necessary, since the non-HO and HO flywheels are keyed differently. An HO throttle cable had to be used, and a slight modification to the gas pedal was needed. The HO exhaust header is needed with the HO cylinder head; luckily the non-HO oxygen sensor fits the HO header. The flow testing also indicated that Jeep injectors have a very narrow spray pattern whereas the Ford injectors spray at about a 60-degree spray pattern making them a better choice in terms of air/fuel mixture. Further research indicates that Ford injectors that should be compatible with the Jeep injector rail can be found in 22, 24, 30, and 36 lbs/hr flow rates. For this application, injectors in the range of 23-24 lbs/hr seem ideal. As of this writing, I now have over 20,000km on the stroker engine. It has seen some offroad miles (it was broken in at Rock Crawl ’99), and it has seen some long distance miles (a 5000km round-trip drive in July). Simply put, this engine is a pleasure to drive! On the highway cruising, it averages between 20 and 21 miles per Imperial gallon. This is in the same ballpark as the original 4.0L. Plus, this mileage was calculated over a 5000km road trip, averaging the speed limit, with full load: full camping gear, plus hauling the Swampers (driving on street tires). Around town and on the trail, this engine isn’t quite as economical as the original 4.0L. I was told that by using the 4.2L rods, my engine will be a revver, not a torquer. This didn’t make sense, since I have yet to meet someone who considers the 4.2L a revver. Suffice to say, what I was told is wrong: this engine loves to idle around all day long. At times, it will seem to stall out, but keep rotating over and start running again, something the 4.0L was never good at doing. The engine does run hotter than the original 4.0L. People attribute this to both the larger displacement and the higher compression. This is not a concern for normal, every-day driving, but on the trail I must use the factory auxiliary electric fan to keep the gauges happy. I am already using the largest radiator available over-the-counter for my truck. The only remaining problem with this engine is locating, then installing the correct size injectors. Because the injectors are too small, warm-up is difficult and there is a steady although very weak ping, even on 94-octane gas. Another area that I will be experimenting with is the spark plugs. I am still also using stock spark plugs; a set that is 1 or 2 ranges cooler may also be in order, due to the high compression. Despite this remaining, this engine is definitely a success. Enough of a success a second stroker has already been built and installed in a friend’s Cherokee. This project has attained all of my original goals, and I recommend this to anyone with a certain amount of mechanical abilities, and who wants to do something a little different than just a regular rebuild. Since completing this motor, various people have approached me for information on the project, and possibly to build more Jeep stroker engines. This article should present enough information to duplicate my work. In addition, I have heard rumours of a project involving longer rods and custom pistons to simultaneously combat the high compression ratio and broaden the torque curve (in theory, anyway). So, if you’re still hungry for more information, SEARCH THE INTERNET. There are all sorts of resources out there that can fill in the missing pieces to your puzzle. I no longer have the time to answer emails about the stroker project (several years of answering the same old questions is enough for me, thanks!). I just bought a 98 jeep Cherokee and am thinking of trying this out. I will take all of the tips into consideration and if anyone has any more please feel free to share. What compression riotas are you considering building for?The word around the boards is that you can get more out of your motor by utilizing a moderate compression ratio with more advance in timing.I aim for a nice balance between the two.My L28 is going to be around 9.2-9.4:1 which is almost a full point higher than the stock 8.5:1 ratio. I Think this will be a decent compromise so I can advance timing to fully realize my motors’ potential, but as I bet you can guess, this is purely theoretical since the cooling on the back end of the L-series heads is so bad. I’ve been told that you can sometimes get more power by dropping the compression ratio and advancing the timing. However, with the stock fuel injection having limitations on how far it would adjust the timing, and the desire to minimize costs on this project, I kept things easier by using the stock components above and chose to live with the higher compression. Also would like to know if putting on a turbo charger or super charger with this build would be a smart choice. As the build is described, your compression would be too high to work with a turbo- or super-charger. 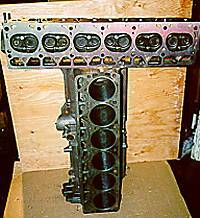 I would look into some of the (now) available kits which use 4.0L rods with custom pistons to drop the compression back to something reasonable. Then, you could consider these. I have a 97 ZJ 290,000 WANT TO DO this I have an 84 AMC Eagle with only 52,000 I want to use is this a comparable pair ?? You certainly could. I think there are a few kits out now, that would make this work easier. Nice walktrough, may I ask what the total cost ended up at and how much time did you spend building it? I was lucky to find a good, very fresh block. It really didn’t cost much, less than a standard rebuild. If you had to bore the block, buy new pistons, etc., you could get the cost down to a regular rebuild too – if you spent time junkyard hunting for the right donor parts. I recommend looking for stroker kits that are available today. It may cost a bit more (not sure), but at least you know that all the parts will be correct. I’d be looking around now. I couldn’t recommend any particular scrap yard, though. These heavy crankshafts are getting old, you’ll have to find a yard that specializes in older vehicles. nice job.. was wondering, i want to build a 4.5 stroker but wanna use the stock rods and kieth black forged pistons . do i need to bore the block or can i just put the piston and rods in and away she goes ? can’t really find info on this subject.. i wanted to do it this way for a lower compression ratio and quench height .. Unless you have a virtually new engine block, you will need to have your block bored to match your new pistons. I would talk to a local machine shop that you trust. As for lowering the compression ratio while dealing with the quench height, you may need to talk to Keith Black directly. The math isn’t hard, but they will be the experts on this matter. So could I make this work with a 2005 4.0? I am wanting to swap a 4.2 longblock into my 97 xj using the 4.0 head and injection, I can find little to no information of anyone doing this swap. plenty on old timers putting 4.0 heads on old carbed engines but nothing on putting an older block into a modern holem the only thing i can figure out is that it will add displacement and stroke while bumping up compression, i just want to know what problems to expect… any thoughts/concerns/help would be awesome!!! As I recall, the 4.2L block uses a different size head stud than the 4.0L, so this may not work. I don’t remember the details. The 4.0L block was improved in many respects, though. i’m going with a 2 barrel carb. ! what do you think? 4.2 block, 4.0 head with 4.0 intake and alterations. As I recall, the 4.2L block uses a different size head stud than the 4.0L, so this may not work. If you want a carb, then I’d try to figure out how to graft it onto the 4.0L intake.